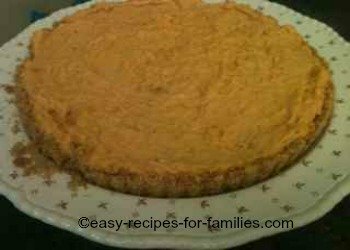 We're making a no bake fresh pumpkin pie recipe and on this page, we'll learn how to cook a fresh pumpkin to make the pumpkin pie filling. 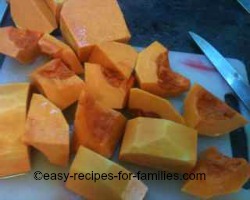 Firstly, the easy way to remove the hard skin from a fresh pumpkin is to cut it into manageable sizes. 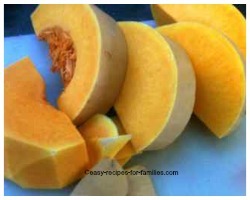 Depending on the size of the fruit, cut it into halves or quarters, then slice off the hard skin. Be sure to work with a heavy sharp knife and a firm chopping board. There's nothing more dangerous than a blunt knife. 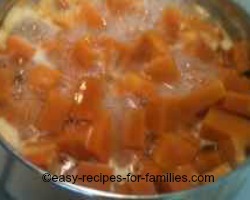 Rinse the pumpkin pieces and then dice them into smaller chunks. 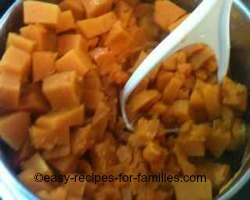 There's no need to cut the fresh pumpkin into even sized as they'll be pureed. To cook the fresh pumpkin, pop them into a saucepan with 2 heaped tablespoons of sugar and enough water to about level with 3/4 of the fruit. Bring to a rapid boil and cook till very tender. Drain the cooked pumpkin, taking care to drain away all excess liquid. Use a colander if required. 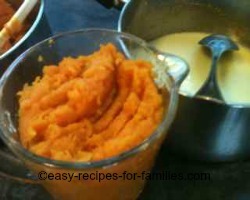 Puree the spiced pumpkin with a blender. But given this is such a small amount, it is just as quick to use a potato masher. and now that the fresh pumpkin's cooked for this pie recipe, it 's now time to make the filling. The rest of the pie recipe are really easy. Leave Fresh Pumpkin Pie Recipe and discover more easy recipes that will have your family running to the table for dinner! Check out easy recipes for delicious one pot meals which can be whipped up in no time at all!